We here at Gazepoint are almost all certified wind junkies. When it’s blowing over 15 kts it’s pretty hard to keep the team focused, and over 20 kts we’re all on the water. Fortunately (sort of) it’s rarely that windy around here, but we are all keen sailors and this years America’s Cup has been an amazing spectacle. 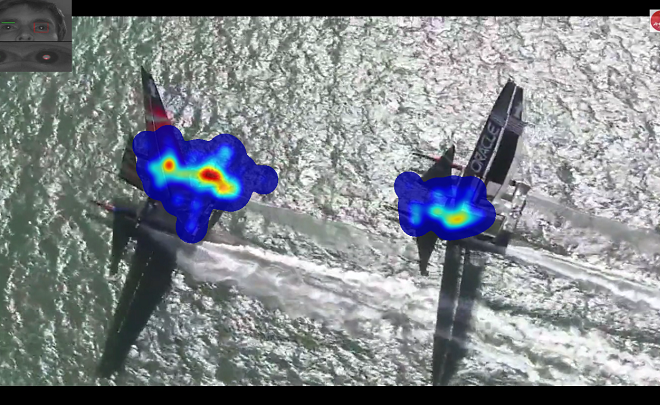 Not only are the boats incredibly fast, the racing incredibly tight, and the suspense incredibly high, the SportVision LiveLine graphical overlay’s may have really added to the viewing experience. It also helps they broadcast on Youtube as most of us don’t have TVs any more. While the the computer vision and graphic overlays are very impressive, do the viewers really actually look at them? Do the viewers use them to enhance their understand of the race? Let’s find out with the GP3 eye-tracker! We recorded a viewer’s gaze over the last race of the series and posted it in the video below. If you watch a few minutes, you can clearly see just how frequently the viewer glances at the overlay graphics to get a better understanding of the current race status. We haven’t run a large sample and done AOI statistics on the viewer behavior (that software is coming soon) but it’s pretty obvious the new graphics are getting a lot of viewing attention. Gaze is ideally suited for both quantitatively and qualitatively evaluating the performance of your visual systems, and the GP3 is ideally suited (and priced!) to get you the gaze information you need!